Les Gens De Mer is 650 ft from Metro Joliette and the tramway Euroméditerranée in Marseille. It offers air conditioned rooms with satellite TV and free Wi-Fi access. Each room at Les Gens De Mer–Marseille has simple décor and has a private bathroom. Some of the rooms have a furnished balcony. Les Gens De Mer buffet breakfast is served daily in the dining area or on the flowery terrace. Guests can enjoy a drink in the hotel’s bar. The Seaman’s Club is a relaxing lounge for guests with a library and a game room. A 24-hour front desk is also available and all rooms are accessible with an elevator. Les Gens De Mer–Marseille is just a 20-minute walk from the historic quarter and old port and 1700 ft from the Mediterranean Sea. Gare de Marseille-Saint-Charles Train station is half a mile from the hotel. Newhotel Bompard La Corniche is in a residential area in the heart of Marseille, a 15-minute walk from the beaches. It has an outdoor swimming pool, a sunbathing terrace and a solarium. Rooms at Bompard La Corniche are individually decorated and have a Nespresso coffee maker and a minibar. Mediterranean-inspired cuisine can be enjoyed in Café Albert Restaurant, featuring a terrace and a dining room with a large chandelier. Guests can also relax in one of the English-style bar’s velvet chairs. Private parking is free on site and Wi-Fi is available throughout the hotel. Guests can visit Marseille’s Old Port just over 1 mile away and La Canebière, 2 miles from the hotel. The Newhotel Vieux-Port is located in central Marseille, between the Old Port and La Canebiere. This designer hotel offers soundproofed rooms with air-conditioning and satellite TV. Each floor of Newhotel has a different theme and the rooms have a private bathroom and a flat-screen TV. Some rooms have a balcony and views of the Old Port. Breakfast is served daily in the classy dining room or in guest rooms. The multilingual staff can also provide information on the local area at the 24-hour front desk. The Newhotel is situated 1000 ft from the Belsunce Alcazar Tram and the Vieux-Port Hotel de Ville Metro Station. The Panier Quarter is just a 10-minute walk away. New Hotel Saint Charles is in the center of Marseille, a 10-minute walk from the Old Port. It has soundproof accommodations, an interior garden and free Wi-Fi throughout the hotel. Rooms at New Hotel Saint Charles come with a private bathroom and satellite TV. Each room is accessible by elevator. A buffet breakfast is served until noon every day in the interior garden. Guests can also take breakfast in their room. There are a number of restaurants in the area. Additional facilities at New Hotel Saint Charles include a free business center in the lobby and a 24-hour front desk. A public parking lot is nearby. Saint-Charles Train Station is just over a quarter mile from the hotel. Noailles Metro station is just 500 ft away and the historic high street in the old quarter of Marseille, La Canebière, is 300 yards away. This Inter Hotel is set in central Marseille, 98 yards from La Canebière and a 5-minute walk from the Vieux-Port. It offers individually designed air-conditioned guest rooms with Wi-Fi. A continental breakfast is available in the mornings. Guests can relax with a drink in the Inter Hotel’s bar during the evenings. Inter Hotel Rome et Saint Pierre is situated 270 yards from Noailles Metro (subway) and a 5-minute walk from Hôtel de Ville Metro, offering fast access throughout Marseille. Saint Ferréol is located on a pedestrianised street in the centre of Marseille, a 5-minute walk from the Old Port. It offers air-conditioned accommodation and free internet access. The soundproofed rooms at Hotel Saint Ferréol are equipped with a telephone, cable TV and private bathroom. The rooms are lift accessible. A buffet breakfast with fresh pastries is served every morning. The multilingual staff at Saint Ferréol Hotel is available to recommend nearby restaurants. Additional services and facilities at Saint Ferréol include a 24-hour reception desk, business centre with PC and free newspapers. Saint Ferréol is 500 metres from Vieux-Port Hôtel de Ville Metro (line 1) and Notre Dame du Mont Cours Julien Metro (line 2). Saint-Charles Train Station is 1.5 km away. Charles de Gaulle parking, located nearby, offers discounts for hotel's guests. Located in central Marseilles, the Lutetia is just a 5-minute walk from Saint Charles SNCF Train Station and La Canebière. The air-conditioned rooms feature free Wi-Fi access and satellite TV. Each guest room at the Lutetia hotel is soundproofed and has a private bathroom. Some also feature flat-screen TVs. Guests have free access to a computer terminal with an internet connection. Free newspapers are also available in the hotel lobby. The staff at Lutetia are available to assist you 24 hours a day, and a buffet breakfast is served every morning. The Réformés Canebière Metro Station is just 220 yards from the hotel Lutetia and the Vieux Port (old port) is a 10-minute walk away. 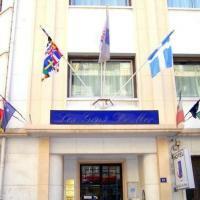 Best Western Bonneveine Prado is located in Marseille, a 20-minute walk from Prado Beach. It has an outdoor pool with a furnished terrace and a tennis court on the grounds. Each air conditioned and soundproofed room is stylishly decorated and have a private bathroom with Italian shower. All rooms are equipped with a flat-screen TV and free Wi-Fi. Axel’s Garden brassiere serves traditional French cuisine and buffet breakfast. Guests can also relax in the hotel bar lounge during the evening. There is a 24-hour front desk with concierge service to provide tourist information. Activities in the area include canoeing, windsurfing and horseback riding. Guests of the Best Western Bonneveine Prado can visit the Old Port and central Marseille, just a 15-minute drive away. Jardin botanique E.M. Heckel and Marseille Borely Racecourse are half a mile away. 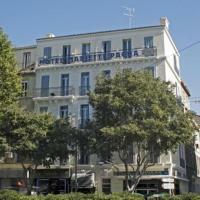 Hotel du Palais is located in central Marseille, a 5-minute walk from the Old Port and the main street, La Canebière. It offers rooms with private bathrooms and free Wi-Fi access. Each of the soundproofed guest rooms features air conditioning, satellite TV and a minibar. The rooms can be accessed by a lift and some include a seating area. Palais Hotel serves a daily buffet breakfast in its breakfast area, where guests can relax with a free newspaper. In addition to a 24-hour reception, Hotel Du Palais also provides a dry cleaning and laundry service and children's toys are available. The hotel is only 150 metres from the Estrangin Prefecture Metro Station and 450 metres from the Opera House. This designer hotel is in central Marseille, 100 ft from the Vieux Port where boats leave for the Frioul Archipelago and the Château d'If. It features modern guest rooms with private bathrooms, air conditioning, a flat-screen TV and free Wi-Fi access. Each of the Carré Vieux Port’s guest rooms is soundproof and has tea and coffee-making facilities. They all have a bathroom with bathtub or shower. Breakfast is served every morning in the dining room, or in the comfort of your guest room. It includes homemade pastries and homemade bread. The hotel bar is open 24 hours a day and serves wine, beer and soft drinks. The Carré Vieux Port is 82 ft from La Canebière and 650 ft from Marseille’s Opera. The Tourist Information Office is within walking distance and Marseille Saint-Charles Train Station is just one mile away. Public parking is available nearby, for an extra fee. Located in Marseille, this Adagio City Aparthotel is just 300 ft from the beach and 3 miles from the Vieux Port. It offers air conditioned accommodations and an outdoor heated swimming pool. Each studio apartment at the Adagio Marseille Prado Plage has a kitchenette equipped with a microwave, fridge and dishwasher. Apartments also have satellite TV and a furnished balcony or terrace. Breakfast is served daily with a view of the grounds and terrace. Free Wi-Fi access is available at the Prado Plage Adagio’s 24-hour front desk. The Marseille Prado Plage Resort is serviced by a bus to the center of the city and just a mile from the Rond-Point du Prado Metro station. The Borely Park is less than half a mile away. Marseille Airport is 14 miles from the hotel. This Kyriad has air-conditioned rooms with free Wi-Fi, Canal+ (cable) and satellite TV. It is located in south Marseilles, 110 yards from junction 2 of highway A50. The Marseille Centre’s restaurant serves a buffet breakfast and international cuisine for lunch and dinner. Guests can relax in the evenings in the hotel’s spacious bar. The Kyriad Marseille Centre Rabatau is 2 miles from Marseilles' Vieux Port and La Canebière, and a mile from the Stade Vélodrome. In a residential district and just under half a mile from the Palais des Congrès, this residence features an indoor swimming pool. Prado Perier Metro Station is just 500 ft away and Wi-Fi access is free. A kitchen equipped with hotplates is a standard facility in the accommodations at Adagio Access Marseille Prado. 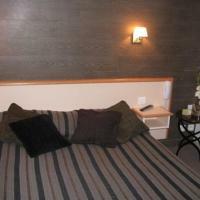 All rooms have an LCD TV with Canal+ channels and some have a separate bedroom. A buffet breakfast of French viennoiseries is served every morning in Adagio Access Marseille Prado's breakfast room. There are drinks and snacks vending machines in the 24-hour front desk, which also has luggage storage. Covered private parking is available on site and the residence can be accessed from the highway A50, a 5-minute drive away. Marseille Old Port is 2 miles away and Parc Chanot is an 8-minute walk from this residence. Newhotel of Marseille - Vieux Port is a designer hotel located across from Pharo Congress Centre, just a 10 minute walk from the Vieux Port. It offers an outdoor pool with a furnished terrace, and gourmet restaurant. The Newhotel of Marseille - Vieux Port’s air-conditioned and soundproofed rooms feature a modern design and come with a flat-screen TV, Nespresso coffee machine and a private bathroom. Some rooms and suites have a balcony overlooking the city. Newhotel of Marseille’s restaurant, Le Victor Café, serves Provencal cuisine and buffet breakfast that guests can enjoy on the terrace. Guests can enjoy a variety of wines and cocktails in the bar. Saint-Charles Train Station is 1.5 miles from Newhotel of Marseille - Vieux Port and Marseille Provence Airport is 16 miles away. Guests receive preferential rates at a nearby parking lot. This Novotel is in central Marseille, between Catalans Beach and the Vieux Port, a 5-minute walk from both. It has an outdoor swimming pool, spa and fitness center. All rooms in the Novotel Marseille Vieux Port are air-conditioned with a private bathroom, satellite TV and free Wi-Fi access. The Marseille Vieux Port’s restaurant serves Mediterranean cuisine and has a terrace offering panoramic views of the Old Port and the swimming pool. The bar serves snacks and is open until midnight. The Novotel Marseille is set next to le Palais du Pharo. Guests can enjoy a massage in the hotel and relax in the hot tub. In Marseille, this hotel is a quarter mile from the Stade Velodrome and Chanot Park. It features air-conditioned rooms with satellite TV and private bathrooms, 1 mile from the beach. An organic buffet breakfast is served daily at the Mercure Marseille Prado. Meals can be served on the hotel’s terrace, which also has Wi-Fi access. Guests are invited to enjoy a cocktail in the hotel’s bar. The Mercure Marseille is a 2-minute walk from the Rond-Point du Prado Metro station, which provides access to the Old Port and Saint-Charles train station. Nearby activities include snorkeling and wind surfing at the beach. Located just 22 yards from the Vieux Port, this hotel offers air-conditioned rooms with free Wi-Fi access and satellite TV. It is in central Marseille, 330 yards from La Canabière. Each guest room at the Europe Hotel Vieux Port is soundproofed and has a private bathroom. The rooms also feature work desks, and hairdryers are provided in the bathrooms. The Europe Hotel serves a buffet breakfast until noon every day and the helpful staff can assist with restaurant recommendations. Additional facilities include baggage storage and a free internet point. The Vieux-Port Hotel de Ville Metro Station is just 150 yards from the Europe Vieux Port hotel and the Saint Charles SNCF Train Station is a 15 minute walk away. This Mercure Hotel is next to the WTC convention building, the Jardin des Vestiges and is just a 5-minute walk from the Vieux-Port. It has air-conditioned accommodations with free Wi-Fi access. Rooms at the Mercure Marseille Centre come equipped with satellite and cable TV and a radio. Each room has a private bathroom with a hairdryer. A full breakfast buffet is served every morning. Guests are invited to enjoy a drink and a light snack at the Marseille Centre’s bar, Le Frioul. The Marseille Centre Mercure Hotel is just a 5-minute walk from Saint Charles TGV Train Station. It is easily accessible by highway A7 and a 25-minute drive from Marseille Provence Airport. Private parking is available for an extra fee. This MGallery hotel is an elegant 4-star establishment in the center of Marseille. Grand Hotel Beauvau’s bar, Le Beauvau, invites guests to enjoy a drink while looking out over Vieux Port and the Mediterranean Sea. Decorated with Provencal fabrics and Empire or Napoleon III furniture, rooms at Grand Hotel Beauvau are air-conditioned and offer satellite and cable TV and free Wi-Fi internet access. The room’s private bathrooms feature a bathtub and shower, a large mirror and offer a hairdryer, bathrobe, slippers and amenities. Breakfast is served daily in the hotel’s dining area or in the comfort of your room. A variety of hot meals and cold snacks are also available with 24-hour room service. The front desk is open 24 hours a day and guests will be welcomed in French, Italian, Spanish or English. Public parking is available nearby the hotel. This luxurious hotel features a heated outdoor pool, a fitness center and a spa with a hot tub overlooking the Old Port. Some air-conditioned guest rooms have a terrace with harbor views. A flat-screen TV with satellite channels and an iPod docking station are featured in the guest rooms at the Sofitel Marseille Vieux-Port. Each elegant room includes a minibar. Some of the stylish bathrooms include a TV. Les Trois Forts restaurant serves gourmet cuisine, accompanied by fine wines and champagnes. It offers panoramic views of the harbor. Guests can enjoy a drink in Le Carré lounge bar at this Sofitel hotel. Catalans Beach is a 10 minute walk from the hotel. The Chateau d’If is accessible by ferry from the nearby marina. Public parking is available on site. This Premiere Classe hotel is just outside of Marseilles, in the La Valentine business district. It offers free private parking, free Wi-Fi access and a 24-hour automatic check-in facility. The air conditioned guest rooms at the Premiere Classe Marseille La Valentine are equipped with satellite TV and private bathrooms. Some rooms also have a bunk bed that can accommodate a third guest for free. Guests can enjoy a daily buffet breakfast and vending machines are available for drinks and snacks. The Premiere Classe Marseille is a 15-minute drive from Cassis and the Saint-Charles SNCF Train Station. It is just 500 ft from the A50 highway and the Marseilles Provence Airport is a 30-minute drive away. Logis Edmond Rostand is located in Marseille, a 5-minute walk from Estrangin Préfecture Metro. It offers a non-smoking environment with modern, air-conditioned guest rooms. 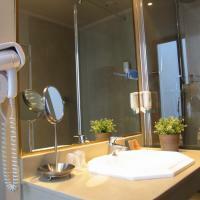 Guest rooms feature a contemporary-style bathroom, satellite TV and free Wi-Fi. The Edmond Rostand restaurant serves a continental breakfast every morning. Guests can relax with a drink and a free newspaper in the hotel bar. Marseille Old Port is a 15-minute walk from the hotel and guests can visit the nearby Marseille Opera. There are numerous bars and restaurants in the streets near the Logis Edmond Rostand. Mariette Pacha offers air conditioned guest rooms a 5-minute walk from Catalans Beach. Set in central Marseille, each room also has free Wi-Fi and a flat-screen TV with satellite channels. Breakfast is available every morning, served in the dining room or in guests’ rooms. Many fashionable restaurants and bars around the Place Thiers and Vieux Port are within easy walking distance. Guests can relax in the Pacha’s lounge, which has Canal+ TV. The business center has a computer with internet and a printer. Each of the Mariette Pacha’s guest rooms is decorated in a Mediterranean style and offers a private bathroom. Some have a balcony. Hôtel Hermès is just 38 yards from the Vieux Port in central Marseilles. It offers a roof-top terrace with panoramic views of the harbor and the city, and free Wi-Fi. Each air-conditioned guest room at the Hermès has a partial view of the Vieux Port. They are soundproofed and feature flat-screen TVs with satellite channels and private bathrooms. The hotel staff is available to assist you 24 hours a day. Guests can enjoy a buffet breakfast every morning, served in the dining room. The Vieux-Port Hotel de Ville Metro Station is just a 3-minute walk from the Hermès hotel. The Saint Charles SNCF Train Station is a 20-minute walk away. Novotel Marseille Centre Prado is located in one of Marseilles’ business districts. It is 50 metres from the Périer Metro Station providing access to all areas of the city. Air-conditioned guest rooms feature a flat-screen TV with satellite channels and a mini-fridge. There are also facilities for making tea and coffee, and the bathrooms include a hairdryer and free toiletries. Free Wi-Fi access is provided. The restaurant Novotel Café offers a menu of seasonal produce and daily specials featuring original and modern cuisine with a selection of salads, sandwiches, meals and desserts. Guests can have a professional meeting, or enjoy a glass of wine in the open space. The Stade Vélodrome and Centre de Congrès are both 1 km away and the hotel is 2 km from the Old Port and La Canebière Boulevard; all of which are accessible by transit. Marseille Saint-Charles Train Station is a 10-minute drive away and Marseille Airport is a 25-minute drive away. Pay public parking is available nearby. This 18th-century stone building is located across from the Vieux Port, in central Marseilles. It offers panoramic harbor views and rooms with free Wi-Fi and flat-screen satellite TVs. Each guest room at Alizé is soundproofed and air conditioned and has a view of the harbor or the courtyard. The modern bathrooms are equipped with a bathtub and a shower and there are separate toilets. Guests can enjoy a daily buffet breakfast, served in the dining room or in the comfort of the guest rooms. The staff at the hotel Alizé are available to assist you 24 hours a day. The Alizé hotel is 110 yards from the Vieux-Port Hotel De Ville Metro Station and Marseille's main road, La Canebière. The Saint Charles SNCF Station is a 15-minute walk away. The Novotel Marseille Est is located 7 miles east of central Marseille, within easy access of highway A50. It offers free Wi-Fi and has an outdoor swimming pool. The soundproofed guest rooms include air conditioning, a TV with satellite and cable channels and a minibar. The Novotel Marseille serves a daily buffet breakfast, which can be served in the guest room upon request. Guests can enjoy a meal or snack in the restaurant, the bar or on the terrace. In addition to the outdoor pool (unheated), there is also an indoor tennis court, petanque area and children’s play area. Novotel Marseille Est is a 10 minute drive from Marseille’s Old Port and 6 miles from the Parc Chanot Exhibition Center. Free on-site parking is available for guests exploring the Provence region by car. The Saint Louis is located in central Marseille, a short walk from the Vieux Port. It offers air-conditioned and soundproofed guest rooms with flat-screen TV and iPod docking station. All of the accommodations have a private bathroom with hairdryer. They are equipped with a work desk, a telephone and free Wi-Fi access. The front rooms feature a balcony overlooking the Cours Saint-Louis and the ones located in the back of the hotel offer views of courtyards and roof tops. The Saint Louis also features a laundry, daily newspapers and a living room with library offering many travel guides. Set in the semi pedestrian street in the district of Noailles, the Saint Louis has a 24-hour reception. Guests can enjoy daily buffet breakfast, served in their room. There are numerous restaurants within easy walking distance of the hotel Saint Louis. Guests can visit Opéra de Marseille and La Canebière, situated within easy walking distance. Located in the business district of Marseille, Le Huitième is just a 5-minute walk from the Parc des Expositions and the Stade Velodrome. It offers soundproofed accommodations with free Wi-Fi. Each room at the Huitieme Hotel is equipped with satellite TV and private bathrooms. A continental breakfast is served daily and Le Huitieme Restaurant serves regional cuisine. Guest can also relax with a drink in the bar. Hotel Le Huitieme is 660 yards from the Ront-Point du Prado Metro station, which provides direct access to Saint Charles TGV Train Station in central Marseille. The Prado Beach is one mile away. Villa Massalia Concorde overlooks the Mediterranean Sea and is only a 5-minute walk from the Le Prado beaches. It features luxury accommodations with a spa, an outdoor swimming pool and free Wi-Fi. Decorated in a modern style, the air-conditioned rooms have a flat-screen TV. Some rooms feature a balcony or terrace with panoramic sea views. Massalia Concorde’s restaurant, Yin-Yang, serves gourmet Mediterranean cuisine. During fine weather guests can dine on the terrace overlooking Borély Park. The Asian-style Chang’An bar serves cocktails and snacks. The oriental Spa Siwa at Villa Massalia Concorde has a range of beauty treatments and massages using natural oils. Its facilities include a gym, sauna, hammam and hot tub. Central Marseilles is 3 miles away. Villa Massalia can be accessed from the airport, a 35-minute drive away or Gare Saint Charles, a 20-minute drive from the hotel. In the center of the city and across from the Vieux Port, this 4-star hotel has an outdoor swimming pool overlooking Fort Saint-Nicholas. It features a fitness room and a poolside restaurant with a panoramic view of the main monuments of the city. 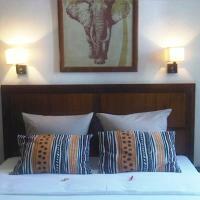 The air-conditioned guest rooms feature either a Provencal or African décor. Some rooms have a view of the port and a Nespresso coffee machine. Each room comes equipped with a flat-screen TV with cable channels and free Wi-Fi access. The Solaris restaurant serves Mediterranean cuisine and Blu Square restaurant serves salads and grilled dishes by the pool. Café Terracotta serves a buffet breakfast every morning, and guests can also enjoy cocktails and tapas in Scirocco Bar, with a view of the port. With a 24-hour front desk, Radisson Blu Hotel Marseille Vieux Port is partnered with the 5 Mondes Spa. This Logis Hotel is located between the Vieux Port in central Marseille and the Creeks of Cassis. It offers air-conditioned accommodation with free Wi-Fi and free on-site private parking. Rooms at the Logis Les Cigalons Hotel have a contemporary décor and a private bathroom. Each room is also equipped with a flat screen TV and satellite channels. Breakfast is served daily at the Cigalons’s restaurant, La Table des Garrigues. It features a shaded terrace and serves traditional cuisine and regional specialities. Hotel Les Cigalons is just a 5-minute walk from the shopping district of Auchan St Loup. It is easily accessible by the A50 and 30 km from Marseille Provence Airport. This Inter-Hotel is located 220 yards from the Parc des Expositions and the Stade Vélodrome in Marseille. It offers soundproofed accommodations, just 2 minutes from the Rond-Point du Pardo Metro station. Rooms at the Inter-Hotel Parc Des Expositions are soundproofed and equipped with satellite TV. Each room has a private bathroom and free Wi-Fi access. A breakfast buffet is served daily and the Inter-Hotel’s restaurant, La Trattoria dell’Arte, serves regional cuisine. The multilingual staff is available 24 hours a day. The Parc Des Expositions Hotel provides private parking and is easily accessible via highway A50. The Vieux Port in central Marseille is less than a 10-minute drive away. Located on the Vieux Port, the Belle-Vue offers beautiful views of the Notre-Dame de la Garde. It has a cocktail bar, and air-conditioned rooms with large windows overlooking the harbor. Each room at the Hotel Belle-Vue is also equipped with flat-screen satellite TV and video games. The private bathroom have a hairdryer and either a shower or a bathtub. Ironing facilities are available. A continental breakfast is provided daily and can be enjoyed in the guest rooms. The hotel’s restaurant serves traditional cuisine from the south of France. La Caravelle cocktail bar has a sunny balcony, where guests can enjoy a relaxing drink. The 24-hour reception offers local tourist information and newspapers are available every morning. Free Wi-Fi access is also provided in the entire hotel. The Belle-Vue is just 270 yards from the Vieux-Port Hotel de Ville Metro station, which provides direct access to the Saint Charles Train Station. Hotel Sylvabelle is in central Marseille, half a mile from the Old Port. It offers 24- hour reception and free Wi-Fi. Guests can choose a dormitory room or a private room with a TV. All of the rooms have large French windows, which overlook the street or the courtyard. It is possible to book a room with a private bathroom but most have shared bathrooms in the hallway. A buffet breakfast is served in the hotel dining room every morning. There are a number of restaurants and bars within easy walking distance of the Sylvabelle. Estrangin Prefecture Metro Station is 560 ft from the hotel and gives direct access to Gare Saint-Charles Train Station. Notre Dame-de-la-Garde Basilica is one mile away. Suite Novotel Marseille Centre Euromed is just a 20 minute walk from Marseille’s old port. It offers a fitness center and suites with a kitchenette, a microwave and a fridge. The spacious and modern suites at Novotel are air-conditioned and offer free mineral water. Each has Wi-Fi access and a TV with movies, video games and music. Some rooms have a balcony. The hotel serves a buffet breakfast every morning and Bar Comptoir Nomade offers aperitifs. Other facilities and services include a Boutique Gourmande snack area and free massages on Thursdays. The 24-hour front desk and tour desk are ideal for information on Marseille. The city center is directly accessible by tram, and the Joliette Metro station is just a 2 minute walk away. Parking is available on site. Residhotel Le Grand Prado is in central Marseille, 100 yards from Perier Metro Station. This residence offers furnished apartments and studios with a kitchenette. All of the air-conditioned apartments and studios at Le Grand Prado feature an LCD TV and free internet access. Each has a private bathroom with a bathtub. Most also have a furnished, private balcony. Meals can be prepared in the kitchenette, which has a microwave, fridge, hot-plates and a coffee maker. The hotel serves a buffet breakfast in the lunch room where Wi-Fi is also accessible. The Old Port is one mile away and guests can walk to Stade Vélodrome in 20 minutes. Public parking is available nearby. This Kyriad Marseille Centre Paradis Prefecture is in central Marseille, a 10-minute walk from the Vieux-Port. It features air-conditioned guest rooms with free Wi-Fi and a flat-screen TV with Canal+ channels. Estrangin Préfecture Metro Station is just a 2-minute walk from the hotel, which has links to the rest of the city. There are numerous restaurants within walking distance of the hotel. Each of the Kyriad Marseille Centre Paradis Prefecture's guest rooms is individually decorated and has soundproof windows and a private bathroom. Guests at the Kyriad Marseille Centre Paradis Prefecture can relax with a free newspaper in the bar. Private parking is available 55 yards away and guests can access highway A50 in a 5-minute drive. Marseille’s Ferry Port is just over 1 mile from the hotel. Hôtel Azur is set next to La Canebière, just 220 yards from Réformés Canebière Metro. It has a shaded outdoor patio surrounded by a Mediterranean garden. Rooms have free Wi-Fi. Each of the Azur’s guest rooms is air-conditioned and has a private bathroom with free toiletries and a TV with satellite channels. A continental breakfast is available in the mornings, which be enjoyed outside in summer. There are numerous restaurants and bars situated within walking distance of the Azur. Hôtel Azur has a 24-hour reception and is situated just a 10-minute walk from Marseille-Saint-Charles SNCF Train Station. Highway A7 is a 5-minute drive away and private parking is available. Le Ryad is located in the heart of Marseille, near La Canebiere and the Old Port. It offers Moroccan-style accommodations with free Wi-Fi internet access. Built in the style of a traditional riad, with a courtyard and garden, Le Ryad offers a range of uniquely decorated rooms. Each is equipped with air conditioning and a private bathroom. The hotel’s restaurant is open from Thursday to Saturday (by prior reservation) and serves traditional Moroccan cuisine. There is a tea salon open daily that serves mint tea, fruit juices and Moroccan pastries. Le Ryad is 330 yards from the Reformés Canebiere Metro Station, and 930 yards from the Marseille Saint-Charles Train Station. Located just 100 yards from Saint Charles Train Station, this residence offers spacious units with a kitchenette. Marseille city center is just a 10 minute walk away. The modern air-conditioned and soundproof apartments have free internet access and are serviced by an elevator. The kitchenette comes with a microwave and a refrigerator. Additional facilities at Adagio Access Marseille Saint Charles include a 24-hour front desk and private parking. A buffet breakfast is served every morning in the breakfast room and there is free Wi-Fi access at the front desk. The old port and Longchamp Park are both a 20 minute walk from the property. Marseille Provence Airport is 16 miles away, which is accessible by a local shuttle bus. This hotel is located in the heart of Marseille, less than a 15-minute walk from the Vieux Port and La Canebiere. It is 800 ft from Estrangin Prefecture Metro Station and offers free Wi-Fi access. Each air conditioned room at the Hotel Esterel is equipped with satellite channels on a flat-screen TV and a private bathroom. A buffet breakfast is served daily. 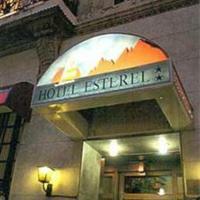 Esterel Hotel features a 24-hour front desk service and an elevator that takes guests to their room. A garden and terrace is available to relax and enjoy the sun. Directly overlooking the Mediterranean Sea, Le Rhul is located on the Corniche in Marseilles. It features a panoramic terrace, and spacious and air-conditioned rooms with private bathrooms. Each of the guest rooms at the at the hotel Le Rhul is equipped with a TV. Most also have sea views and a private terrace. At the hotel restaurant, guests can enjoy local specialties for lunch and dinner, along with a daily breakfast. Facilities at the Rhul include private parking and free Wi-Fi access in the hotel’s public areas. The hotel staff is available to assist you 24 hours a day. The Vieux Port (old port) and the Pharo are just a 20-minute walk from Le Rhul hotel, and the beaches are a short walk away. The Hotel Terminus is located across from the Saint-Charles Train Station in central Marseille. Just a 10-minute walk from the Vieux Port, it features accommodations with private bathrooms and free Wi-Fi. Each room at the Hotel Terminus Saint-Charles comes equipped with a flat-screen TV and satellite channels. A continental breakfast buffet is served daily and the Saint-Charles Terminus Hotel also provides free newspapers. The staff can provide local tourist information at the 24-hour front desk. The Hotel Terminus is a 5-minute walk from the World Trade Centre and the Canebiere Garibaldi Tram stop. It is easily accessible by highway A7 and an airport shuttle service is available at the train station. In central Marseille, these modern apartments are just a 10-minute walk from the Vieux Port. They feature wired internet access, a flat-screen TV and a kitchenette. All of the soundproof accommodations feature a private bathroom and have a radio. The kitchenettes include a dishwasher, microwave and a fridge. Guests at the Adagio Marseille Vieux Port can enjoy fresh coffee from the coffee maker in each apartment. At the Adagio Marseille Vieux Port, breakfast is served every morning in the dining room. There are many restaurants and bars within walking distance. Marseille Saint-Charles Train Station is a 10-minute walk away. Jules Guesde Metro Station is a 3-minute walk from the residence, with fast access throughout Marseille. Public parking is available on site. Hotel Du Petit Paris is located in central Marseille, 200 metres from La Canebière and a 10-minute walk from Vieux-Port. It offers simple rooms with a TV and free Wi-Fi access. 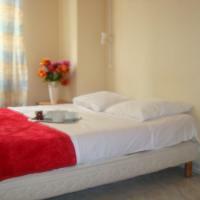 Each room has washing facilities in the room and a shared bathroom. Guests of the Hotel Du Petit Paris can find numerous restaurants and bars in the surrounding streets. There is a 24-hour front desk service. Marseille-Saint-Charles Train Station is just 500 metres from the hotel. Guests can also visit the nearby Marseille History Museum and Opera de Marseille. Hotel Escale Oceania Marseille Vieux Port is a boutique hotel on the famous Canebière, half a mile from St.Charles Train Station and just 300 ft from the Vieux Port. It offers air conditioned rooms with free Wi-Fi internet access. Each of the Escale Oceania Marseille Vieux Port’s guest rooms has soundproofing, a flat-screen TV with cable and satellite channels and a private bathroom with an Italian shower. Some rooms have a balcony with views of the harbor and Notre Dame de la Garde. A buffet breakfast is served in the hotel’s modern dining room each morning or in guests’ rooms upon request. Vending machines for drinks are in the hotel lobby. The hotel’s front desk is open 24 hours a day. Additional services available include bike rental, a dry-cleaning service and baggage storage. Marseille Opera House is a 2-minute walk from the hotel and the Fort Saint-Jean is a 15-minute walk away. The hotel is 16 miles from Marseille Airport. This Citadines features self-catered apartments in Marseille, a 3-minute drive from the A50 highway and a 5-minute walk from Castellane Metro. Each apartment has an equipped kitchen and free internet. The Marseille Castellane also has a dry cleaning service. Breakfast is available in the mornings and can be enjoyed on the terrace. Guests can visit the Prado beaches, a 10-minute drive from the Citadines Apart'hotel Marseille Castellane. Each of the Citadines’ apartments also has a comfortable sitting area as well as a TV, radio and CD player. Each kitchen comes with a microwave, fridge and electric stove. This hotel is next to Marseille’s Parc Chanot Exhibition Centre, just over half a mile from the Vélodrome Football Stadium. It features self-catering accommodations with private gardens and free Wi-Fi. The studios and apartments at Apart’hotel Marseille Prado Chanot feature air conditioning, an equipped kitchenette with microwave and dishwasher, and satellite TV. Some rooms have a balcony with view of the garden. Citadines Apart’hotel Marseille provides a daily continental breakfast, served buffet style. Dry cleaning and laundry facilities are also available. The Périer and Rond Point du Prado metro stations are both within half a mile of the Citadines Apart’hotel Marseille Prado Chanot.